I love Man Ray. There’s something still so – cool – about his photographs, even today in our digital informal age. Hauntingly evocative of my favorite era, I usually rather narrowly think of him in context of 20′s fashion. There’s no better representation of the iconic beauty of that time than his Noire et Blanche, seen above, appearing in 1926 Vogue. However, there’s another angle to Man Ray’s work that a new exhibit at the Phillips Collection makes plain. Opening this Saturday, May Ray, African Art and the Modernist Lens highlights the link between his work and the movement to promote African artifacts, elevating them to the status of modern art. The exhibit showcases more than 50 photographs by Man Ray, with about 50 more of his contemporaries like Cecil Beaton and Alfred Stieglitz. 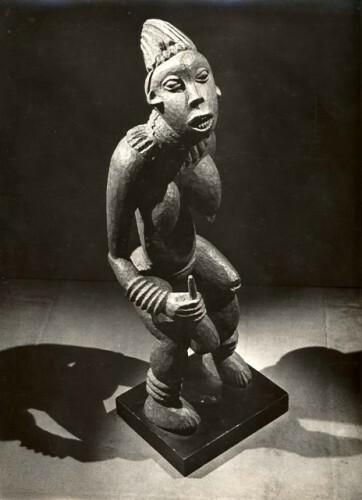 Several are matched with the original African objects they feature, for the first time, allowing the viewer to make the connection on how photographers can influence perception. It also features my favorite Man Ray photograph. The exhibit is neatly divided into four sections to help educate you about the relationship between the modernist movement and the Harlem Renaissance, surrealism, and fashion. For a costume designer like me, the fashion section is the most fun, though the others certainly help expand your knowledge. 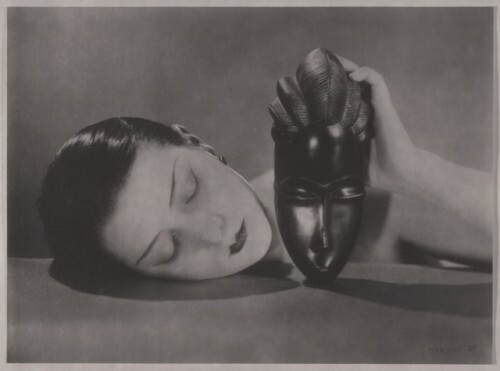 Man Ray did a whole series of fashion photographs called Mode au Congo featuring models with extraordinary African headdresses – the contrast of the models with their makeup (not to mention an outlandish juxaposition of cigarettes, suits and headdresses!) really hits the exhibit’s message home. Shooting the headdresses in this way made them accessible and palatable to his audience, setting off a whole mania for African art and culture in the mainstream. Some of the actual headdresses are shown here as well. I’ll end with my favorite Man Ray photograph as teased above. 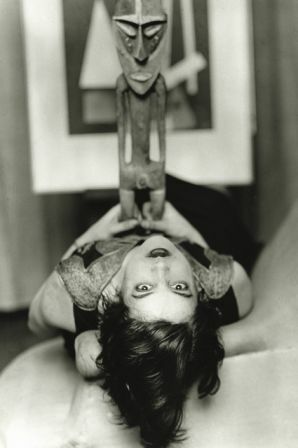 You could certainly write a whole thesis on this image of Simone Kahn and a Vanuatu sculpture. It’s got everything, really – gender, race, fashion – I’ll let you mull it over on your own. Frankly what gets me every time is the sense of both weight and weightlessness in the composition. And the direct, provocative gaze. Definitely worth a trip over to the Phillips Collection to see in person.